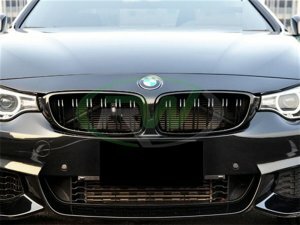 Are you getting tired of that unsightly set of chrome grilles on the front of your BMW F32 4 series, F80 M3 or F82 M4? RW Carbon has a simple solution for you with these affordable and high quality gloss black grilles. No longer is it needed to buy these grilles from BMW at double the price. Our grilles are guaranteed to fit perfectly and are built using the same quality and attention to detail as the ones you would buy from the dealership. With straightforward installation, a set of new gloss black grilles will have your BMW looking more aggressive and unique in no time.